Jollytime Topsfield Elektra was born on April 24, 2005 in Maryland. She came to live with us in July 2005. She graduated from obedience class in September 2005, and began her training with part-time visits to Cave Comics under the watchful eyes of her predecessors, Hoover and Flash. She was to be the first female Vice-President that Cave Comics ever had, breaking through the glass ceiling of the ol’ boy dog club. She was a very shy at first, but is becoming more outgoing as she vies for attention from her new assistant Kirby. She is now working full-time and enjoying her workdays more and more. She is the quintessential lady and though shy, she will win you over with her baleful stare and quick roll for a belly rub. Vital statistics: Elektra stands 13″ high at the shoulders, is 24″ long from neck to base of tail and weighs about 48 lbs. She is exceedingly sweet and lovable, albeit a tad shy. Jollytime Topsfield Romeo (a.k.a. Kirby) was born June 5, 2006 in Maryland. He came to live with us in October 2006. 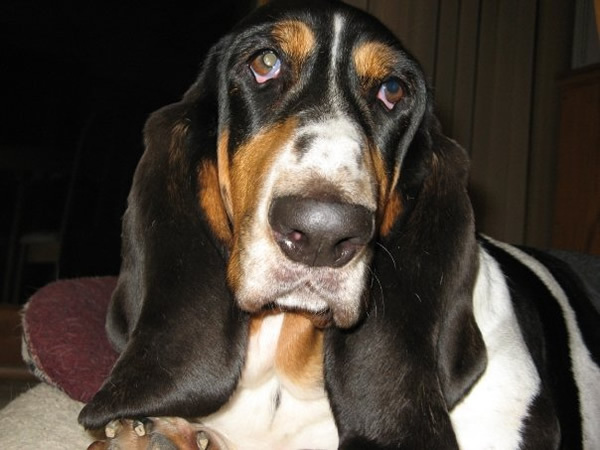 Kirby is the son of the Number One Basset hound in 2001, 2002 & 2003, Ch. Topsfield Bumper Cars. He is still undecided about pursuing his own show career, as he enjoys spending his weekends off chasing Elektra around the yard at home. He truly enjoys his work at Cave Comics as he is a master greeter. He started out working part-time assisting Flash and spent lots of time learning from the master. He now works full-time, and loves all the customers, employees, delivery people and anyone else that comes through the door. He just can’t get enough attention and is always up for a pat on the head from anyone he sees coming through the door. Although Elektra is his senior, he has taken it upon himself to help her overcome her shyness and endeavors to show her that greeting customers is great fun. Vital statistics: Kirby stands 15″ high at the soulders, is 27″ long from neck to base of tail and weights about 55 lbs. He is the sweetest dog we have ever owned and he just wants to have fun! Brendans-Brevis Hoover was born on February 11, 1993 in New Jersey. He came to live with us on April 16, 1993. Hoover was a vocal puppy and whined and cried all the way from Bethany to Southbury (about 30 miles), and he has been whining ever since! He graduated from Obedience school in 1994, and embarked on a promising show career by attending matches as a puppy. He, however, took exception to the judges examining his private parts and took to growling at the judge. This does not win points in the dog show ring, and in fact, gets you excused from the ring. Thus ending his promising show career! 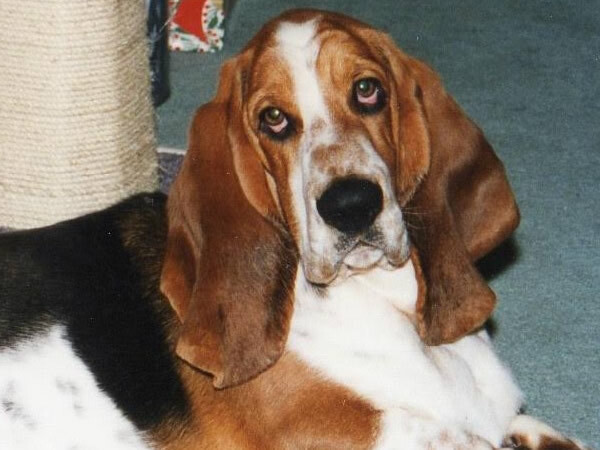 Hoover began working at Cave Comics at a very young age, assisting our first basset, Sherlock, as Assistant Vice President in charge of customer relations. Hoover excelled at his new job, and is a master at greeting customers at the door and whining for attention. He has been perfecting his technique for many years now, and was promoted to Vice President upon the passing of Sherlock in 1994. Hoover has graciously accepted a co-vice-presidency with Flash, who joined him in 1994, and has brought his own flair to customer relations at Cave Comics. Vital Statistics: Hoover stands 14″ high at the shoulders, is 23″ long from base of neck to base of tail and weighs in at about 70 lbs.. He has a wonderful gentle personality and is exceedingly sweet, albeit a bit neurotic. Brevis Caxton (a.k.a. Flash) was born on May 19, 1994 in Bethany, Connecticut. He came to live with us in October 1994. Flash was a very dominant puppy and was a little aggressive with other puppies, so we took him on a trial basis to see if he would get along with Hoover. Hoover was always a submissive dog, and took well to being bossed around by the much more dominant Flash. We opted to keep Flash, and he became an immediate fixture at Cave Comics. He trained diligently with Hoover and became a master at sleeping in front of the door, to make sure that he did not miss the comings and goings of any customers. 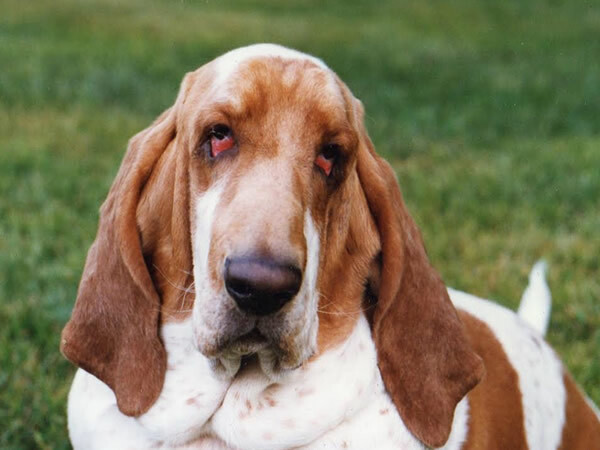 Flash also began his dog show career in 1995, and became a champion in June 1997, by winning a basset hound specialty show for the second time! That was very exciting for us, as this was our first champion. Flash loved to show. His dominant personality made itself known in the show ring as he would spar with his competitors. His stance would say “Move over guys, I have arrived”. 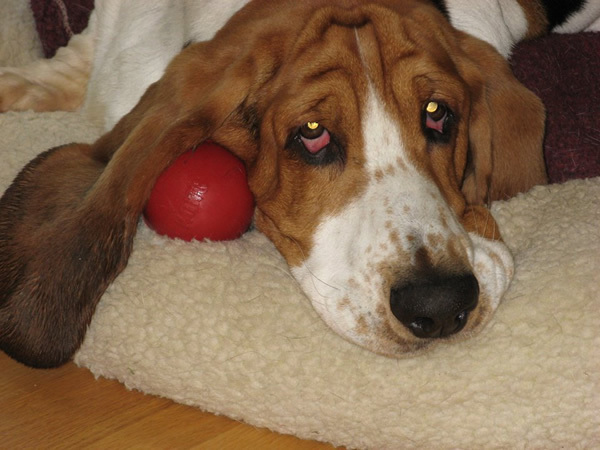 Flash did quite a bit of traveling during his show career, traveling to Pennsylvania, New Hampshire, Rhode Island, New Jersey, and even Indiana for a Basset Hound National Specialty show. Flash’s main area of expertise at Cave Comics is his attention to small children. He loves kids and babies and is proficient at providing kisses to babies in carriers and small toddlers alike. Vital Statistics: Flash stands 13″ high at the shoulders, is 21″ long from base of neck to base of tail and weighs in at about 65 lbs.. He has a sweet personality, but if he gets mad at one of us, he can hold a grudge for a week.